Stay at The Highest Rated RV Park in the Monterey Area! Yanks is the new upscale big rig RV resort at the gateway to Monterey. We offer the best amenities and RV sites built to the highest standards, with the discriminating RV traveler in mind. Our facilities are designed to accommodate all RV sizes from motorhomes and fifth wheels to campervans and tent trailers. 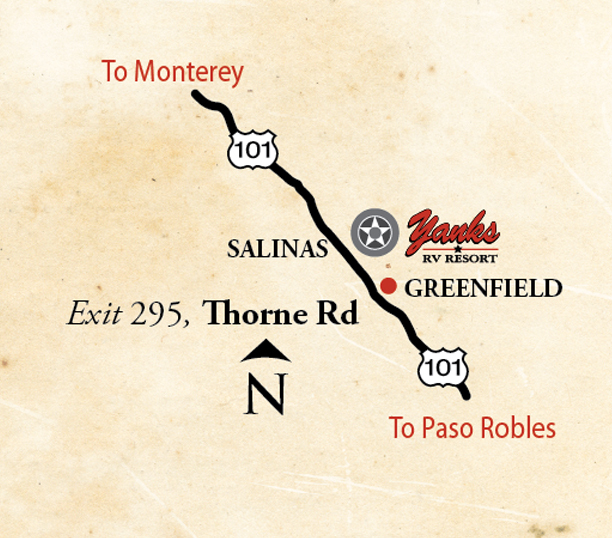 Yanks RV Resort is located on Highway 101 near Salinas, between Monterey and Paso Robles. The RV park is only minutes from the tasting rooms of the Monterey County wine region or hiking trails at Pinnacles National Monument.